The recent Supreme Court decision related to the baker refusing to bake a cake for the gay couple has me thinking. 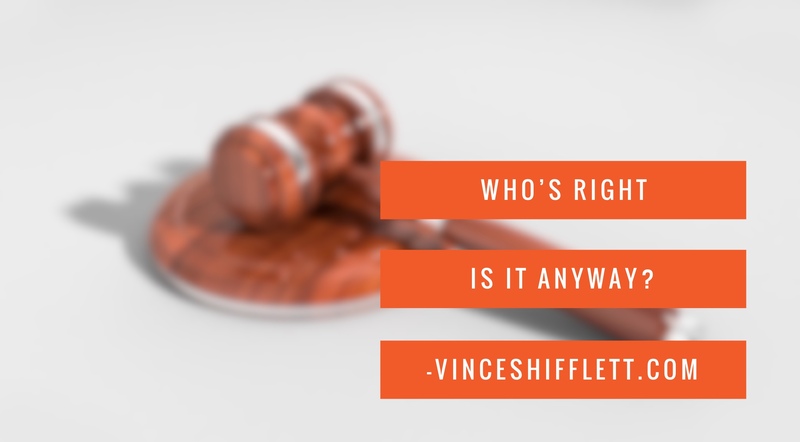 According to the constitution, what exactly is one’s right? Do we all have equal rights or not? There seems to be an overwhelming need to be right in society today. Is that need to be right really an attempt to control things? Suppose you came into the Emergency Room where I was working and you needed CPR or life support to save your life but it was against my religion to use artificial means to save anyone’s life? So I would refuse and let you lie there and die? Of course not. It is my right to continue to believe the way I believe about artificial life support but it is also the right of the patient to have artificial life support. Suppose you go to the store and the Catholic behind the register refuses to sell you birth control because it is against her religion. The Muslim behind the register refuses to sell you that Easter Ham because it is against their religion to eat pork. The Mormon behind the register refuses to sell you Coke because it goes against their religious belief. The Jehovah’s Witness refuses to sell you that birthday card that you need badly for a birthday party tonight because Jehovah’s Witness believe it is wrong to celebrate holidays or birthdays. No one wants to be forced to do anything that is beyond their religious belief but where to we draw the line. I’m not asking the Muslim to eat the ham. I am only asking him to ring me up at the register. The gay couple was not asking the baker to attend the wedding and celebrate with them. They were only asking him to sell them a cake. I am not asking the Jehovah’s Witness to celebrate or attend the birthday party with me. I am only asking her to sell me the birthday card. Is this where we are headed? Anyone can refuse you any service based solely on the fact that they do not believe the way you do? It is time we all look past our nose and stop all the judgment. It is not anyone’s place to refuse service to another based on what you believe is right or wrong. That is called judgment. You are judging another by refusing service. You are saying they are wrong. You are essentially taking away their rights so you can practice your rights. So you believe in the Bible. Does that give you the right to refuse service and kindness to someone who doesn’t? Remember Jesus sat down and had dinner with the scribes and Pharisees. They were considered the chiefs of sinners but he didn’t deny them their right to dinner just because they didn’t believe the way he did. He instead showed them love, kindness, and respect. We all deserve equal rights but what happens when you use your rights to deny me my rights? It all comes down to respecting and loving all regardless of religious belief, sexual orientation, or any other belief. All the different religions in the world are man-made and often used to divide us. Many wars are the result of religion. Many court battles are the result of differences in religious belief. Fighting in the name of God. Something about that just doesn’t seem right to me. I have come to realize that I am only responsible for me. I love a quote from the bible that says, “Let EVERY man work out his OWN soul salvation.” It did not say for you or I to work out another’s belief. Lets all work together to ensure that EVERYONE has THE RIGHT. If the baker doesn’t want to bake the cake, fine. That is his right. Move on to a baker who would love to bake the cake. Why the court battle and drama? If a gay couple wants to express their love through marriage, fine. That is their right. Why all the discussion, arguing, and discrimination? Why is it you can vote on how I live my life but I have no say so in how you live yours? Allow each individual to live the life they love. It is their right. What are your thoughts on this matter? I would love your feedback. As always, thank you all for your love and support. Until next week, live in peace and allow others to do the same. Thanks for sharing. Appreciate you. I agree with the notion of religion dividing and controlling people and I agree with the idea of move onto the next baker scenario, I think Mark’s idea is great, however certain elements in society will deliberately go to those shopes/stores etc to cause friction. I’m not necessarily talking on the LGBT community but perhaps PETA or the Feminist Movement or some other group who thrive on friction and conflict. Where you mention about the Muslim not selling ham, the JW not selling cards etc, my take on that is either not to employ them or to get them to sign a contract stating that they are fully aware that they will be selling those items. Here in England we have had a couple of cases where Muslims have refused to make, ie cook, or hand over anything with bacon in it. One such case, I believe, was at a McDonald’s. Surely the member of staff would have known, by virtue of the name, that a ‘sausage and egg’ or ‘bacon and egg’ McMuffin would contain pork. Sometimes people take on the jobs so as to have their 5 minutes of fame. As for religion itself, the older I get the more I get to believe that it was created to divide and control the masses. I would like to believe that there is a great power somewhere and that there is an after life/re birth of some sort, but no one has ever come back from the dead and told us. I look forward to the next chapter in the VS Chronicles. Another awesome thoughtful, well-written response. You always make me think. Thank you so much. Mark, Transforming . . . I never quite understood the whole lawsuit thing either. If you don’t want to bake a cake for me, I’ll gladly take my business elsewhere. I still love you and am open to dialogue. Coming from a very conservative, religious upbringing, I understand the need to follow what are closely held beliefs. I’ve explored many of my own childhood beliefs and have chosen to change them. 1 – Post on every door to your facility the people you don’t want to serve. Be open about it. 2 – Post on the homepage of your website the people you don’t want to serve. Let me know ahead of time. Less drama for all of us. 3 – And if you’re accepting tax benefits by posing as a non-profit organization, pay your fair share and operate like any other business. Why should you be subsidized with tax benefits? That’s all. Keep up the thought provoking posts Vince. Thank you so much for your thoughtful, beautiful response. I love your idea about what to do if your religious doctrine is creating separation and division. Thanks again and much love to you. I love this post. I’ve had so many conversations with people about this topic. Religious arrogance is what I call it. The use of religion and religious texts in this way is absolutely rooted in judgment, and doing so is incongruous with the teachings of the very book these people used as their moral guide. There’s often (but not always) condescension attached to these “infringements”. Better Than Syndrome, as my deeply Catholic mama used to say. It’s not lost on me that these people never seem to rally against corruption in the church, homeless and hungry children (and adults) right around the corner from all of us. The part that really baffles me is thinking that because you don’t do/believe *insert action*, that others shouldn’t do/believe it either, especially if it’s not remotely harmful. My Life, Liberty, and the Pursuit of Happiness are not up for consideration by anyone but me. The notion of God/Universe/“Something Bigger Than Us” attempts to scratch a deep psychological itch for most people. At its core religion was intended to create inclusivity, but has been used as a powerful weapon to marginalize, discriminate, and as we all know, take the lives of others. The ultimate control mechanism. Fear attracts the fearful. My mom grew up in a small rural town with lots of corn, but a scarcity of people who were different than her. When I came out it was such an awakening for her and I’m so grateful to this day that her love for me allowed her to re-examine her beliefs and complete ignorance when it came to people of color, LBGT folks, and the hardest of all for her: atheists. Despite my disdain for these people who want to take away my right (whatever it may be), I always stop and remind myself that they are a product of those who came before them, and that I hope they are open to re-examining their beliefs for validity and applicability before affecting another human’s life. Once again another thought provoking well written response from you that I am grateful for. My Mom also grew up in a very small rural town but it never kept her from loving all without judgement. My definition of true Christianity. I recently saw an episode of What would you do, where they did an episode of a baker refusing to bake a cake and was surprised by the responses. It saddens me by the things people will focus on and not focused on loving and respecting Everyone. You are so right. It is very sad to see the things people focus on instead of just loving. Thanks as always for your love and support. I love you. I support your summary. If I can change someone opinions, based on my kind actions, then I am happy for it. Grateful for your feedback and I so agree with you. I do believe that it is our actions that will lead to the change of some opinions.